Cycling Southland's Nick Jeffrey is part of a southern deputation along with Stephen Canny and Dale Tye attending the 2012 UCI Track Cycling World Championships in Melbourne to promote the Junior World Championships in Invercargill in August and to shadow event organisers to gain ideas on running large scale events behind-the-scenes. 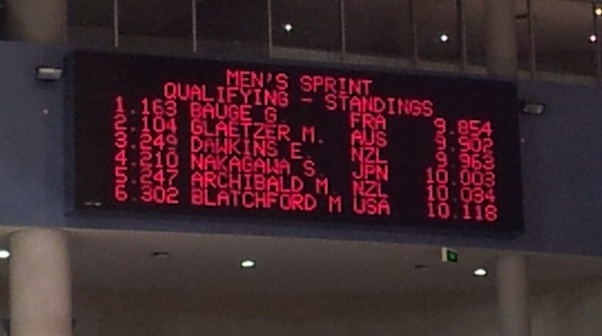 Friday was a pretty special day to be a Southlander at the World Cycling Champs as firstly Matt Archibald and then Eddie Dawkins set new low times for a New Zealander in the Men's sprint qualifying. A huge field of 53 took to the start line with Matt 18th away and Eddie 28th. Matt showed how it was done recording the fastest time ever by a New Zealander with a 10.034. We were so stoked for him. His progression has been massive and he's pretty much done it off his own bat. A more dedicated trainer I have yet to meet. Congrats mate - 12th fastest in the world over 200 metres. Not too shabby. That time laid down the gauntlet and Big Ed did not disappoint. The 10 second barrier has gone with Eddie being the first Kiwi to hit the rarefied air of 9.963. It earned him seventh place in qualifying and boy was it great to watch. Steve Canny made the call to anyone listening (and I was Steve) that Ed would break 10 seconds. So it proved. Earlier Ethan Mitchell lowered his personal best to 10.163 which got him in to 21st and Sam Webster finished 19th with 10.122. All four men qualified which in the company thhey were keeping was a phenomenal effort. Eddie was the only one to progress through his second round match up, beating American Michael Blackford. Ethan nearly brought the house down when he attacked Sir Chris Hoy early and all but caused the boil-over of the championships. Sam was just as close to taking out the defending champ - another Brit - Jason Kenny and Matt couldn't quite run down Scott Sunderland. 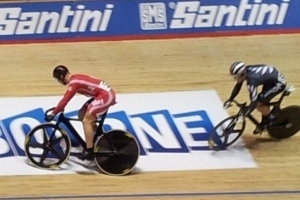 Eddie then finished behind Jason Kenny is the 1/16 ride and couldn't beat Sir Chris in their reperchage. From all of us, massive congratulation guys - you did us proud. Rather than getting easier, the Olympic selection dilemma is getting harder by the day. Will they take three sprinters or four and who will ride what? Great problem to have ... but it is still a problem. Can't wait to see Eddie, Matt and Simon van Velthooven is business on Sunday in the Men's Keirin. Elsewhere today Jo Kiesanowski started her Omnium and Shane Archbold finished his. A top five for Novie including a good end to the competition in the scratch and kilo events will give him a boost. Jo didn't get off to the best of starts in the Flying Lap but showed through strongly in the Points and Eliminations to sit in contention at the halfway point. Vic Pendleton won passed Anna Meares in their sprint semifinal en route to her fifth world title in six years. Meares took the first race when Pendleton hit the deck down the final straight. She slid a long way and lost a fair bit of skin and skin-suit. At that point I wouldn't have given her a prayer of progressing and that looked to be the case when Meares was first across the line in the second race before getting relegated for leaving the sprinters lane. 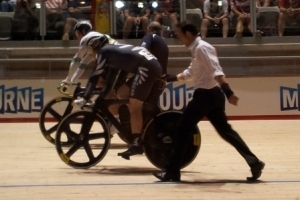 That set up a decider and Pendleton rolled Meares on the line to progress. You could hear the air get sucked out of the stadium as the photo finish result was posted. An emotional Meares eventually had to settle for bronze. The sprint competition was something I will remember for ever. Even at National level there is a fair degree of inevitability about the results and most are clear cut - Eddie and Simon's dead-heat at the Festival of Speed a couple of years back being a notable exception. But in Melbourne the busiest bloke in the stadium was the photo finish operator. Time and time again it would be down to a super slow-mo to decide the winner. And with the likes of Hoy, Kenny, Bauge, Sireau, Foerstemann, Perkins and co - it has been something special to watch. Naturally (given my man-crush on Sir Chris) I had mixed emotions as our two Kiwi boys lined up against Hoy in the sprint rounds. He had to go from a long way out to shake off Ethan, before being beaten to the line by Mickael Bourgain and dropping in to the repechage. There he faced spirited battles with Eddie and Scott Sunderland before winning through in three against big Robert Foerstemann. He now has the best part of a day to recover with the semis and finals on tomorrow night. There was drama also when Bourgain was relegated in his deciding ride-off against Aussie Shane Perkins to put the Aussie through to the semis along with Hoy, Jason Kenny and Gregory Bauge. You think New Zealand has selection issues. Who does Great Britain pick for the sprint? Reigning World Champ Jason Kenny? Or Hoy? That is the shame of the Olympics in the sprint events. The top ten qualifiers yesterday were made up of a Kiwi, three Frenchmen, two Germans, two Brits and two Aussies. At the Olympics half of those guys won't ride because countries can only enter one rider. Good news for Eddie or whoever rides the sprint for New Zealand. 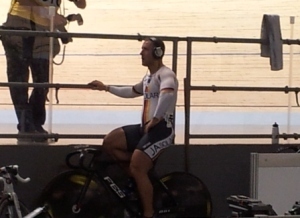 I did have to take a photo of Foerstemann warming up beside us on rollers. His thighs warmed up for a couple of minutes before the rest of him turned up and got on the bike. Unbelieveable. Off the bike the day started and ended with drama. The MCG was shut so my trip to the National Sports Museum is delayed for another day. Instead it was a trip in to town and up 300 metres to the southern hemisphere's highest viewing platform. 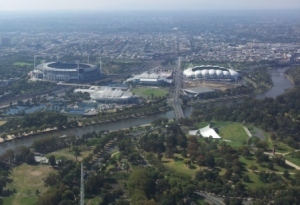 View is pretty good, looking down on to Olympic Park with the MCG, Rod Laver Arena, Hisense Arena and AAMI Park from left to right in the picture below. Well worth heading up for a look. Southbank is another beautiful place in Melbourne - I think this may be the first international city I've been in that I could almost be persuaded to live in ... almost. All of the nations here have information packs on New Zealand and Junior Worlds - which means I won't have to bring them all home with me - phew. There has been very positive feedback on attending and very good awareness of the event. The Japanese were beside us in the media area and were very keen to get information for their team who will be coming to ride. You can tell at an event like this just what a sleeping giant Asia is becoming on the world cycling landscape. The night ended with a half hour of quality time stuck in a lift. The only way to get directly to the basement of Hisense (which provide access to the track centre) is by lift. So naturally once the night ended with Laura Trott winning the Omnium Elimination (two falls in the first lap by the way) the crowd filtered out and there is always a good queue at the lift. Unfortunately it does mean that the 8 person maximum is sometimes stretched a little. And whether the last few in on this occassion made the difference I don't know. But we were jam-packed in like sardines for half an hour which did get a little hot and sweaty. Day four of competition tomorrow includes Men's IP, Women's Keirin (GO TARSH! ), end of the Women's Omnium and the Men's Points Race. Should be another good one.